Set within Kapalua Resort's 23,000 pristine acres, complete with green fairway or azure-blue ocean views, guests experience casual elegance, privacy and comfort in this tropical paradise. The one-, two- and three-bedroom villas are a minimum of 1,200 square feet with full kitchens, washer/dryer, A/C, and large living and lanai areas. Exceptional service and amenities offer guests a 24-hour reception center, full-service concierge, and shuttle service. Area Airports: Kapulua West Maui - 10 minutes, Kahului Airport (OGG): Approximate driving time is 50 minutes and distance is 35 miles. 13 restaurants throughout the resort for Villa guests to choose from. 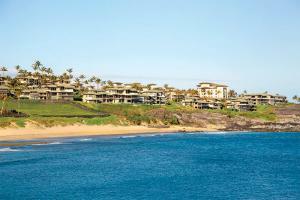 Kapalua is home to ancient Honokahua burial grounds discovered during the construction of the Ritz-Carlton hotel adjacent to the Villas. In 1992, the resort's parent company also donated Pu'u Kukui, an 8,661-acre forest with rare and native plants and animals, to the Nature Conservancy of Hawaii. The resort's 1,600-acre grounds also include the Catholic Sacred Hearts Church and Kumulani Chapel for weddings.